Hampton, VA – 150 laps was the distance for last weekends Late Model Stock Car race where Greg Edwards grabbed another pole this season with a time of 16.021 seconds (88.758 MPH). On what a lot of drivers were calling a slick track with the sun beating down hard all afternoon. Matt Waltz, who has the most wins on the season, would line up to his outside for the green flag clocking a lap time only four ten-thousandths of a second slower with a time of 16.025! Brenden “Butterbean” Queen was able to pilot his machine into the third starting spot on the gird. Terry Carroll had to be the shock of the evening when he put his Carroll Automotive machine fourth on the grid. Danny Edwards Jr, who has had an outstanding run since his return in the Hampton Heat, put his Danny’s Glass machine fifth on the grid. When the green flag dropped over the field Waltz and Edwards dive into turn one side by side. As the two went into turn three Matt Waltz slid way up the track and fell back as far as eighth spot. It did not take long for Greg Edwards to steal the show after holding off a hard charging Brenden Queen & Nick Smith. It didn’t take to long for the night’s first caution as Robert Bruce went for a spin all by him self, no contact was made with the wall or another car so it was back to green flag racing in no time. Nick Smith, Duane Shreeves, and Matt Waltz were just a few to try their luck on the outside. When the green flag was back out the top three cars started to check out with Nick Smith holding strong on the outside. It didn’t take long for Waltz to break back into the top five by passing Terry Carroll on lap sixteen and set his sights on Edwards, Jr. By this time the field had settled down and really started to run some good green flag laps. Smith worked past Queen for the second spot, which ultimately started the down fall of Brenden Queen on the night. The nights second caution came from the solo spin of Danny Edwards, Jr who looked to have some contact with Waltz, the contact sent Edwards, Jr car around coming out of turn four. Coming to a halt just before the inside retaining wall. 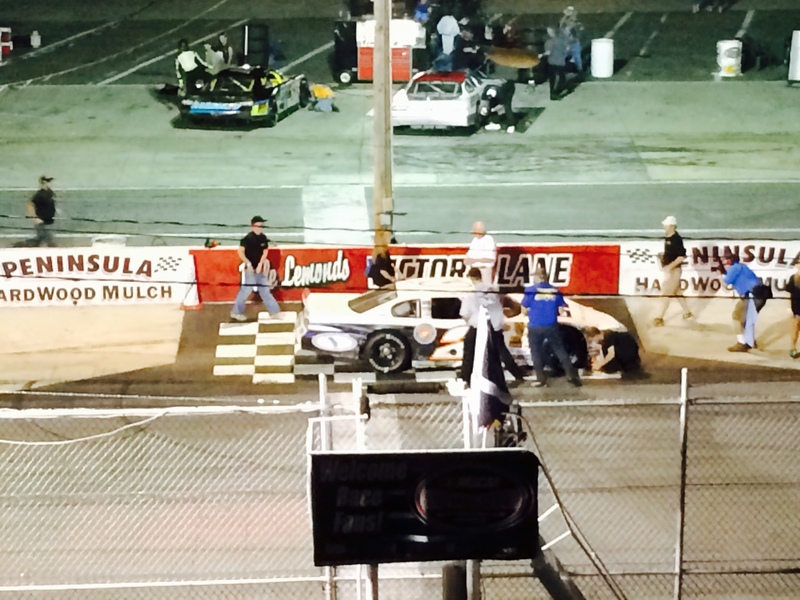 Edwards, Jr did end up falling a lap down has the leaders passed him while his car sat on the apron. As the Krispy Kreme cone came out, Greg Edwards elected to start on the outside as he has that right. Matt Waltz also took him up on that offer as he has really found how to make the top groove work. It did not take long for Waltz to take the lead from Edwards, on the outside mind you on lap 67. Waltz and Edwards would spend pretty much the rest of the race either side by side or nose to tail with Nick Smith holding on to the third spot, not gaining or loosing any ground on the leaders. Which made you think if Smith was waiting to see if the two leaders got into any trouble. Looked like Smith just ran out of car and time and just could not make the charge to the front. With 50 laps to go, Waltz started to really pull away from Greg Edwards using the higher groove to his advantage. Seemed like Edwards last hope in catching back up to Waltz would be using some lap traffic as a pick to get the lead back. However, the odds were not in his favor tonight as the lap cars of Duane Shreeves and Justin Carroll did not want to yield the “right away” so to speak causing some issues for Edwards. This allowed for Waltz to open up a half straightaway lead over Edwards and was the final nail in the coffin for as Matt Waltz would cruise happily to his tenth victory on the season. Greg Edwards, Nick Smith, Brenden Queen, and Mark Wertz completed your top five! After the race we were able to catch up with race winner Matt Waltz and figure out what just happened on lap one. Normally Matt Waltz would hate to see the caution flag wave because that usually means the hard work he just put into creating a lead would be wiped away but this time the two yellow flags were just what he and his crew needed to get him back in the race. Just so happens the second caution was after contact was made with his car so we asked him to explain what happened from his point of view. They will take the car back to the stables and do some homework in search for just a little bit more speed and return to the track Saturday, August 23rd for Twin 64 lap features in search for wins number eleven and twelve on the season.